Raith went into tonight’s game on a run of 3 defeats in the last 4 games and will be looking to recreate the run that saw them go 7 games undefeated prior to this. 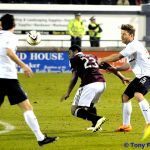 However, they faced a stiff test against the Championship’s runaway league leaders, Hearts, who go into this game on the back of 6 straight wins, including the ten nil demolition of Cowdenbeath. Since we played them back in November, Hearts have won 13 league games out of the last 15 matches, leaving them requiring 8 points to clinch the league title and promotion back to the Scottish Premiership. Rovers defeat to QOS on Saturday left Raith in no man’s land in the Scottish Championship, being now 10 points off the pace for the promotion play offs but 15 points ahead of the relegation play offs with still ten games to play. The Rovers last win against Hearts in a competitive fixture was way back in 1993, with David Sinclair scoring the winning goal that day. Hearts made three changes to their line up with McHattie, King & Keatings coming into the starting eleven, replacing Eckersley, Walker & Sow. Raith lined up with one change to the starting line up from Saturday with Anderson coming in for Scott. The team lined up as McGurn, Thomson, Watson, Barr, McKeown, Anderson, Callachan, Fox, Conroy, Vaughan & Nade. On the bench are Cuthbert, Hill, Moon, Stewart, Robertson & Matthews. 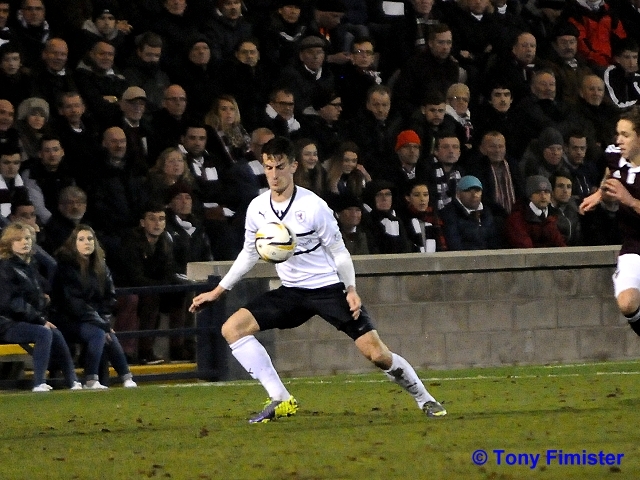 It was a dark cold misty night at Stark’s Park and it was a big noisy travelling support that made their way over from Edinburgh almost filling up both the North stand as well as the Key Tech stand with about 3,500 visiting supporters in the ground. In contrast the South Stand looked comparatively empty. Referee George Salmond blew to start the game and Rovers kicked off up the hill towards the Hearts support in the McDermid stand. Neat defensive play from Callachan allowed Rovers to clear early Hearts pressure. The first chance of the game went to Hearts in the 4th minute with an excellent low save to his left from David McGurn – Sam Nicholson fed the ball through to Keatings who was in an offside looking position but blasted his shot goalwards but McGurn saved easily. 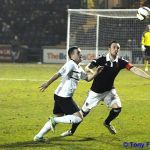 Two minutes later, McGurn was called into action again to save from Billy King. 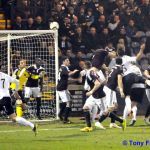 Already, it was clear that the Rovers keeper was in for a busy night. 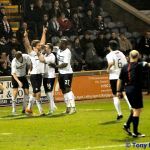 The Rovers defence was being well tested in the early stages but Craig Barr was looking very strong in commanding the Rovers defence, leading, shouting & organizing those around him. In the 12th minute, the Hearts number 19, James Keatings went down cheaply for a free kick just outside the box. The ball driven in to the six yard box but a determined punch away by McGurn cleared the danger and Watson blocked the eventual shot from Nicholson. Hearts were on top for the first 15 minutes with 2 or 3 clear chances and the majority of possession. 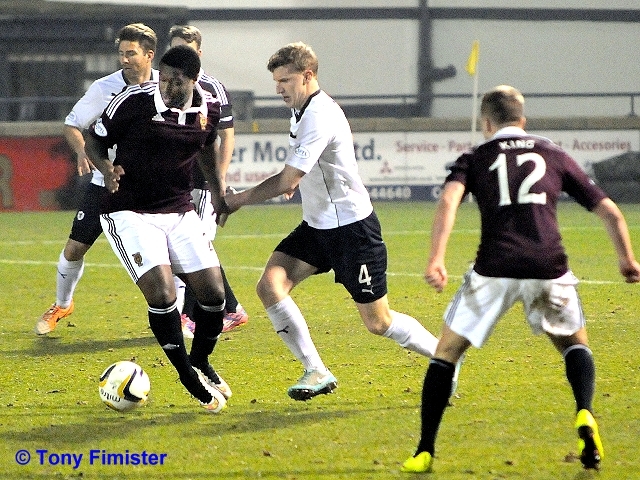 In particular, Gomis was playing well in midfield for Hearts and controlling the game. Hearts continued their offensive and after another chance, this time for King, after a pass from Zeefuik but his shot went wide past McGurn’s right hand post. David McGurn had to produce another excellent save, diving low to his right to clear Keatings shot from just outside the box. From the resultant corner, Zeefuik had an excellent chance but his shot was blocked on the goal line by McKeown, then the ball fired over the bar. 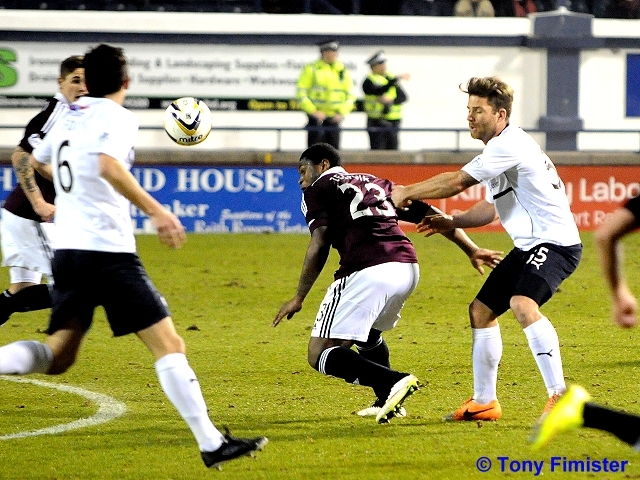 The Jambos had created three chances in quick succession and were really piling on the pressure. 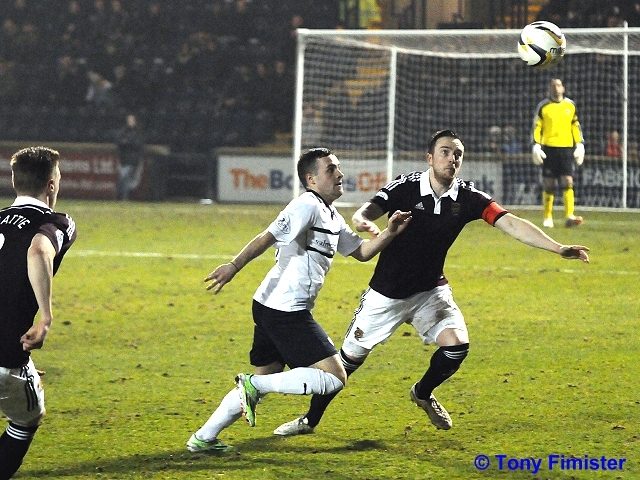 Raith were holding on at 0-0 thanks to David McGurn and some determined blocks & last ditch tackling from the defence. Rovers did create a rare opportunity in the 28th minute with a free kick played on to the head of Watson but his header was high and wide. 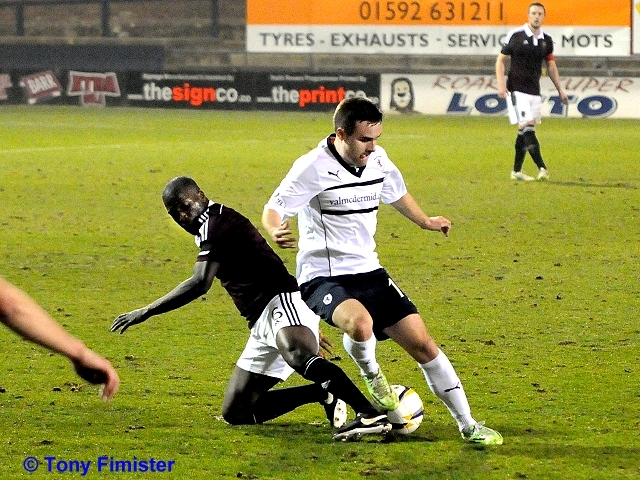 Rovers were made to pay directly from this attack with a bizarre goal from Hearts number three Kevin McHattie. James Keatings shot took a deflection, the ball then fell to McHattie who tapped in from close range, leaving McGurn stranded. The Hearts player looked to be a good 3 or 4 yards offside, the referee seemed to delay blowing his whistle for the goal and looked to the linesman, but his flag stayed down, much to the horror of the South Stand and the goal was given. Rovers 0 Hearts 1. Hearts continued to dominate the game with chances for both King & Paterson who both hit shots high and wide of the Rovers goal. Rovers then created another chance of their own with some great work by Anderson, who played the ball to Callachan who couldn’t quite find the space to shoot, so he played it to Conroy on the edge of the box but his shot was wasteful and went high and wide over the Hearts goal. 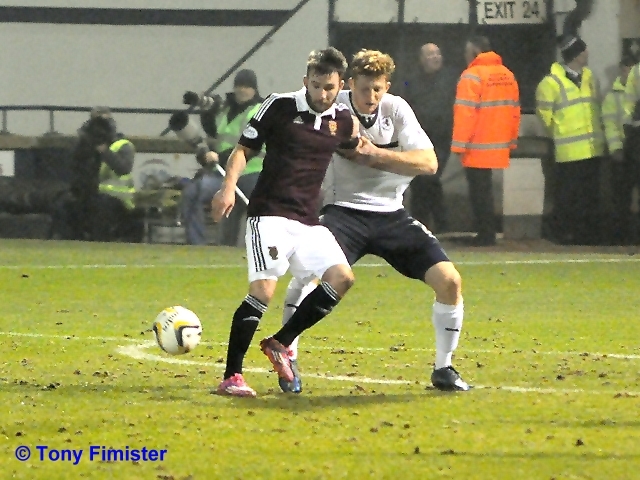 Rovers were finally getting a foothold into the game after Hearts had dominated the first 40 minutes. Anderson again found space down the right hand side and made his way to the bye line and whipped over a great cross that Christian Nade couldn’t quite get his head to it at the far post. 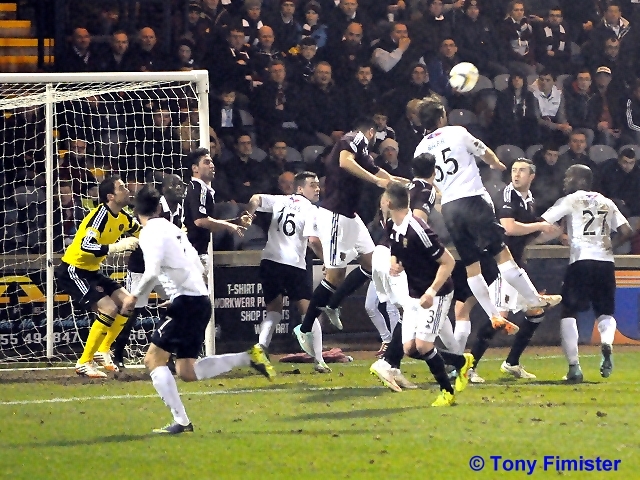 McKeown the fired in a long range throw into the Hearts box that was cleared by the Hearts defence for a corner kick. 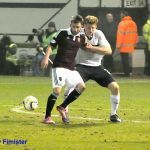 Ryan Conroy took the corner deep into the Hearts box, and the Rovers Number 55, Craig Barr produced a powerful header which went right into the top left hand corner of the Hearts goal for the equalizer. 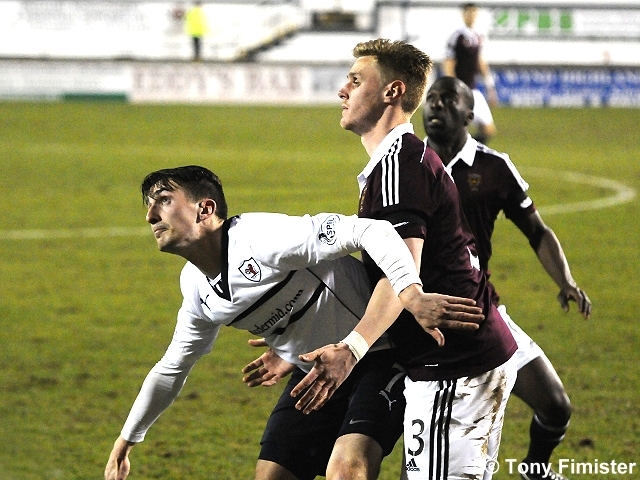 Raith 1 Hearts 1. Hearts may have deserved to be in front, but Rovers equalizer was well deserved for sheer dogged defending and deserved to be level, given the injustice of the Hearts opener. The Raith players left the pitch at half time to a mix of cheers for the team for the equalizer and boos for the Railway stand linesman for not raising his flag for offside for the Hearts goal. Hearts had dominated the first half, creating a wealth of chances, but the combination of some superb goalkeeping by McGurn and stubborn defending by the Rovers defence had seen Raith hang on in the game and get their reward with Barr’s goal. The second half kicked off with no changes to either line up and with Rovers shooting towards the home support in the South Stand. 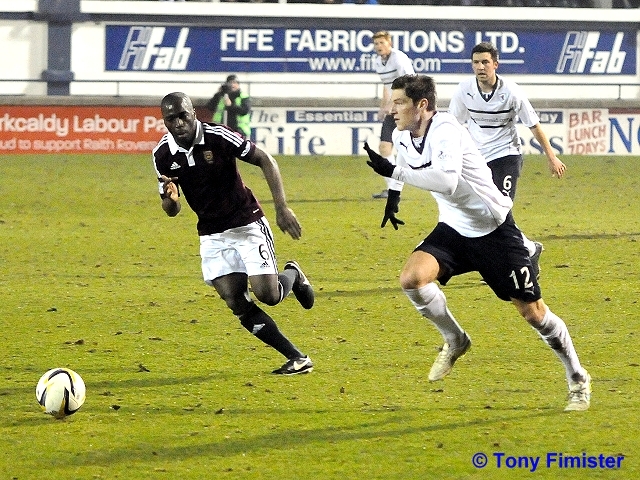 It was Hearts that started the half on the attack. Sam Nicholson hit a dipping shot from outside the box that looped over the keeper and hit the stanchion, with many of the Hearts support thinking that the ball had gone in the net. 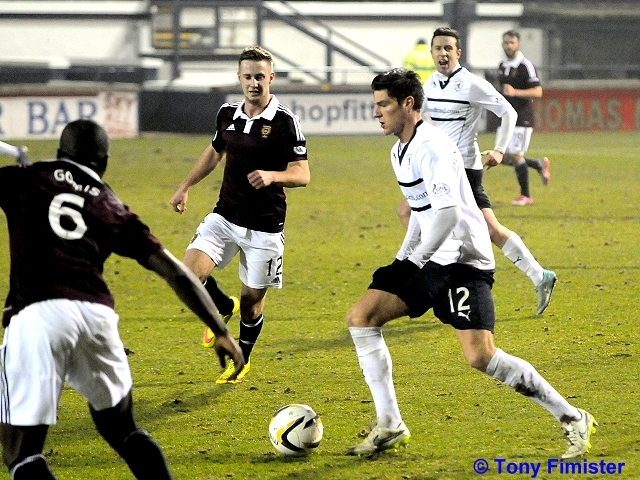 The Jambos continued their attack with a chance for Zeefuik again, but is shot was straight at McGurn. 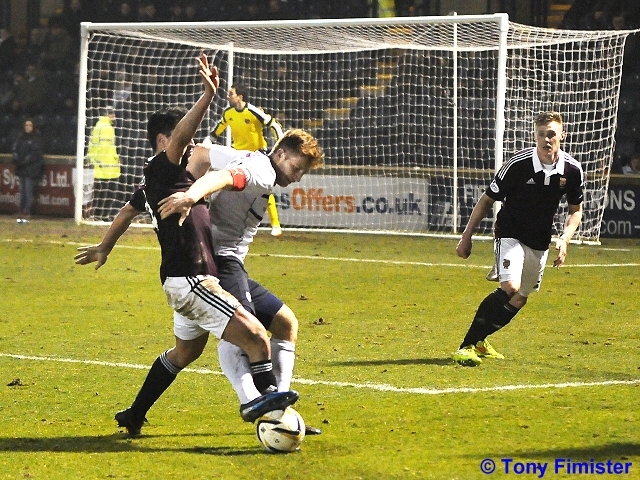 Grant Anderson was then booked for enthusiastic looking tackle on Hearts Billy King 30 yards from the Rovers goal. 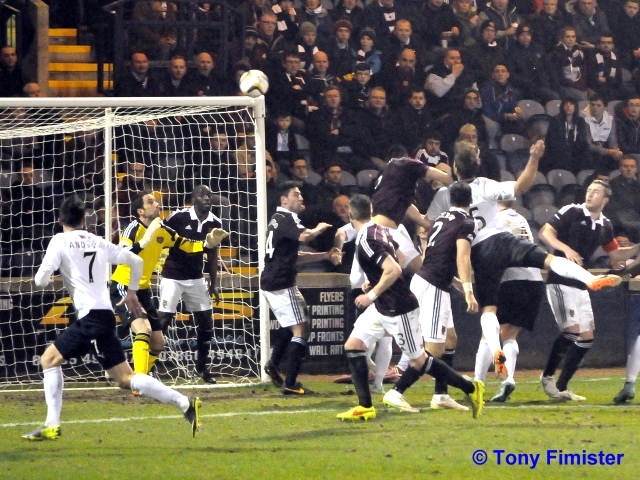 From this free kick, Ozturk fired in a terrific shot that looked netbound, but Davie McGurn palmed it away as it fired towards the far right corner of the net. 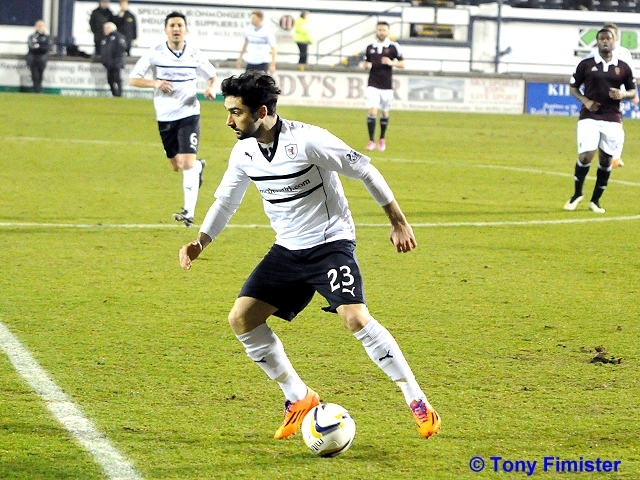 Zeefuik was a real thorn in the Rovers defence and again he picked up the ball just inside the Rovers 18 yard box spun round and sent the ball just over the Rovers bar. Just after the hour mark, Rovers began to get into the game. Lewis Vaughan took a free kick and tried to surprise the Hearts keeper by firing towards the near post but Neil Alexander was more than equal to that and saved easily. 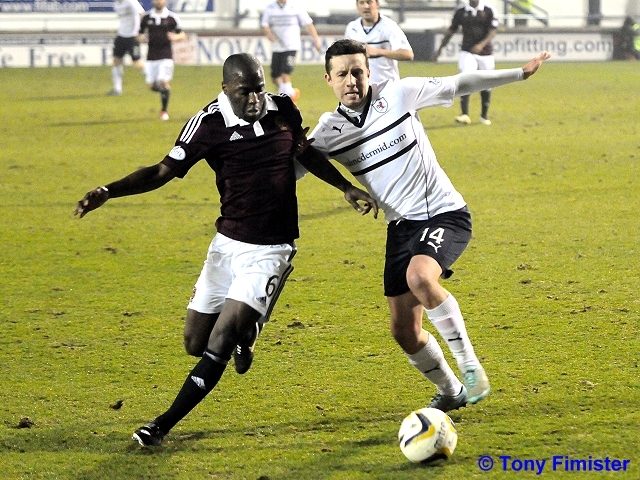 Grant Anderson then fired in a cross that again just evaded the head of Christian Nade. At this stage, Raith were having their best spell of the game and looked like they might be more than capable of taking something from the match. However, the momentum turned in the 65th minute. 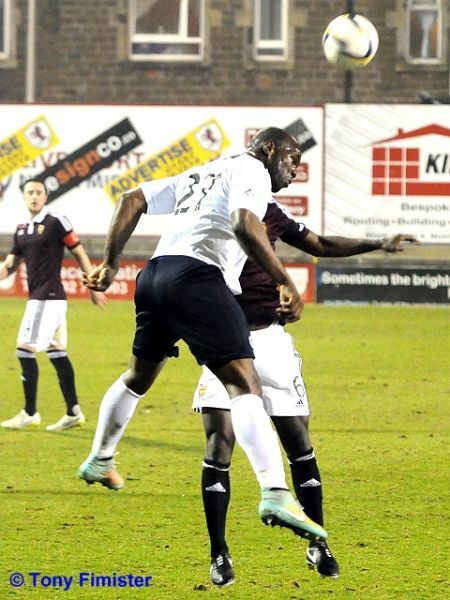 Christian Nade and Kevin McHattie both went in forcefully for a 50/50 ball in midfield, McHattie came off worst and seemed to spin round on his back side. The referee reached straight into his top pocket for his red card and gave Nade a straight red sending off. This seemed harsh for the 50/50 challenge and left the Rovers with ten men and a very challenging 25 minutes against the league leaders. Could the Rovers hang on from here? Hearts number 2, Callum Paterson had a great shot from 25 yards out but always going wide of McGurn’s post. In the 71st minute, Mark Stewart came on as a sub as Grant Murray reacted to the sending off of Nade to restructure his ten man team with Vaughan coming off. Rovers really needed Stewart’s fresh legs up front in an effort to hold the ball and take the pressure off the now beleaguered Rovers defence. Two minutes later, Robbie Neilson made what was to be a decisive substitution with James Keatings coming off to be replaced by former Rovers loanee Jamie Walker. More Hearts pressure ensued. Nicholson shot straight at McGurn. 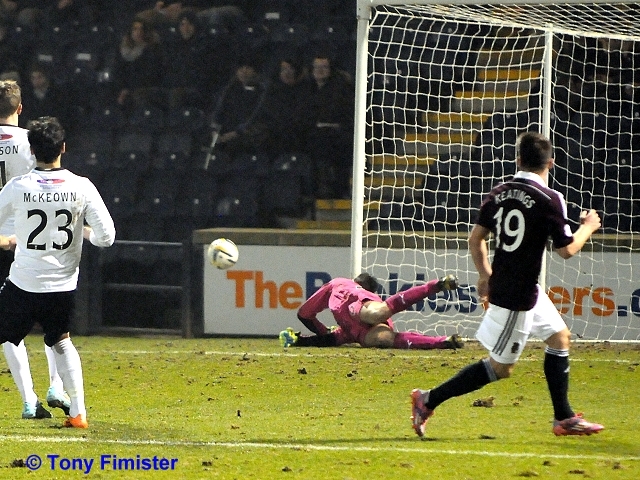 Nicholson again had another shot saved by the Raith keeper. At this stage Hearts really applying pressure to the Raith defence with 3 good chances in the last 5 minutes. 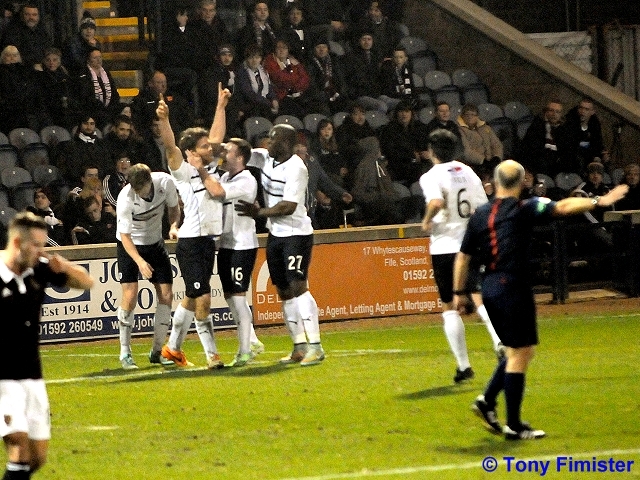 Raith were holding on, but only just. Jamie Walker was getting into his groove and had a good strike towards the Rovers goal, but McGurn got down well to save. Fifteen minutes to go and it was all Hearts pressure. Raith could not get the ball and when they could they could not hold on to it, apart from a couple of breaks from Mark Stewart. With 12 minutes to go, the Raith resistance was finally broken. Jamie Walker, who was looking majestic since coming off the bench scored with superb strike. He cut in from the left and slammed a low shot past McGurn in the far corner. The goal had been coming. 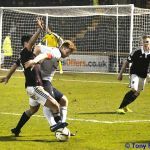 Rovers had defended stoutly but with ten men the task was becoming impossible to hold on against the free flowing league leaders. Rovers just couldn’t maintain any possession in the Hearts half as they tried to get back into the game and Hearts continued to apply pressure to kill off the game. With just 5 minutes remaining the game was over as a contest. 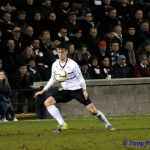 Jamie Walker collected a stray back pass following confusion in the Raith defence, he laid the ball off to Billy King, whose shot deflected off Rory McKeown as he tried to block the shot and went flying into the net beyond McGurn. 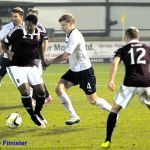 Raith 1 Hearts 3. Hearts made a couple of late changes with Anderson and El Hassnaoui coming on for Zeefuik and King and they held on to record another win as they took themselves to touching distance of the league title. A brave performance from the Rovers against a very good and worthy champions. Hearts dominated the game for long spells and the statistics show that Hearts had 62% possession and had 25 shots on goal to Rovers 4. Raith dug in and kept themselves in the game with some dogged defending and some superb saves from man of the match David McGurn. There were other notable performances from goalscorer Craig Barr for his bravery and leadership, and the tireless Callachan & Anderson. 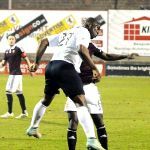 It was always going to be a challenge for Rovers to take something from the game but the sending off of Christian Nade made it virtually impossible as Hearts took advantage in the closing stages against a tired Rovers side. Rovers now have to look positively to the last quarter of the season as they try to finish with as many points as possible and look to build ahead for next season. Keatings with another effort brings a fingertip save from McGurn. Moments later McKeown blocks a point-blank Zeefuik effort. Goal Hearts. King nets from a position that looked well offside. Goal Raith!!! Barr glances Conroy's corner in!!! Rovers up against it with a man short. hearts happy to ping the ball about. Raith welcome runaway league leaders Heart of Midlothian to Stark’s Park on Tuesday evening for this rearranged league tie. Both clubs will be eager for the three points for different reasons as the Edinburgh outfit close in on the Championship title whilst Raith are keen to kick start their league campaign again following a narrow defeat away at Queen of the South last Saturday. Notably, up until last Saturday, Rovers had been on a decent run of league form with only one defeat going back to 20th December, coming against Rangers at home last month. Away from the league, the midweek Scottish cup tie at Inverness was a welcome distraction but proved to be a very difficult encounter in which the Premiership side controlled large periods of the match and limited a hardworking Raith side to very few opportunities in front of goal. Inverness saw out the game more comfortably than the 1-0 score line would suggest. This forthcoming game between Raith and Hearts is the first since the poignant occasion at Tynecastle back in November where a near capacity crowd reflected on both club’s significant contributions in the First World War, and of course joined together commemorating the role of former players in the McCraes Battalion. 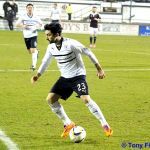 The match itself was settled by a single goal coming from a long range strike by Heart’s defender Ozturk early in the first half, and despite a spirited display and late pressure by Raith, Hearts managed to see out the game. Since then, Hearts have been in unstoppable form recording 13 wins from 15 league matches, only dropping points in a draw with Hibs and losing once at home to Falkirk. Hearts are now a massive 20 points ahead at the top from nearest challengers Hibernian and with only 10 games remaining and it does appear to be a case of ‘when’ not ‘if’ Hearts win outright promotion back to the top flight. If Raith are to get anything from this match then they will need to have reliable ‘keeper David McGurn at his regular best and new defensive pairing Craig Barr and Paul Watson on top form against a free scoring Hearts side who have netted just the 14 goals in their last two games. Lewis Vaughan and Ross Callachan, both products of the Raith Academy will be keen to build on their own improving, and goal scoring displays of late, with Lewis netting a superb strike at Queen of the South on Saturday which will surely have helped his confidence. Finally, the form book is not favourable for Grant Murray’s men with the last victory against the Jam Tarts back in 1993; a goal from fan’s favourite Davie Sinclair enough to separate the sides on the day. Referee for the match is George Salmond.